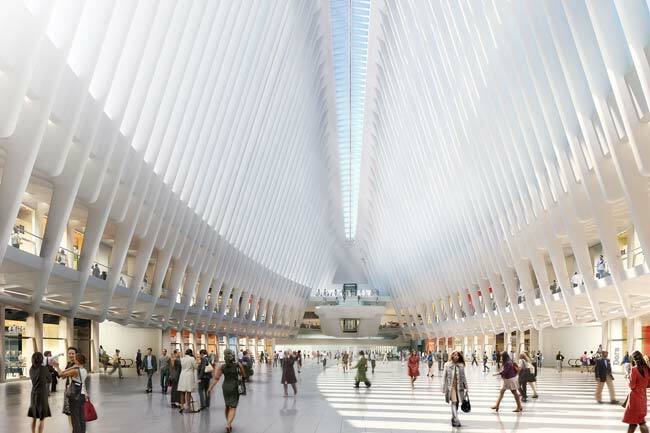 Apple is finalizing lease plans for the luxury shopping mall planned for the World Trade Center site, according to a report from IFOAppleStore. IFO claims the mall developer has already signed a lease with Victoria's Secret and negotiations are in process with Michael Kors, Swatch and Abercrombie & Fitch, among other retailers, including Apple. The website for the project contains a number of renderings of the proposed buildings, including the one above of the shopping area. A one square-block memorial park has already opened at the site, and work is well underway on one of four high-rise office towers that will surround the park. The shopping mall will occupy space under three of the towers, and on the lower floors of two towers. Perhaps not coincidentally, the three towers were designed by architects Foster + Partners, who are working on Apple’s new California headquarters and the future San Francisco 2 retail store. Construction on the three office towers and a major transit station is in the early stages. The mall is scheduled to open in 2015, when the Apple store would open. Apple already has a number of Apple Retail Stores in New York City including Fifth Avenue, Grand Central, SoHo, Upper West Side, and West 14th Street. The company has long been rumored to be looking at locations for a new store in the Williamsburg neighborhood of Brooklyn. Crap, another awesome Apple store incoming. The Grand Central store is a thing of beauty. Man, that Westfield logo is hideous. Financial District is dead after 5:00pm. If I ever need a Genius Bar appointment, I am coming here. I'm beginning to think that Calatrava is a bit of a hack, or at the very least is getting a little repetitive. This looks a lot like the interior of the Milwaukee Art Museum and its Brise Soleil. pretty sure williamsburg has more mac owners per capita than anywhere else on the planet. (fwiw, mikey's tried a store in dumbo a year or two ago.. it lasted about a year.. not sure if an apple store would do so well down there either. When Apple brings a store to Brooklyn all we're saying is that they are other places in the borough that's better (both visually and accessibility) than Williamsburg. I would seriously rather Downtown Brooklyn or nearby Barclays Center than any where in Williamsburg. Near Barclays the transportation is extremely better from anywhere in the city! That goes for Downtown BK as well. Near Borough Hall. The rumored 66 Boerum Place location (at Atlantic Ave.) would be perfect. It's near Borough Hall and a bunch of subway lines (2,3,4,5,R,A,C,F,G). It's easily accessible by foot to people living in Downtown, Boerum Hill, Brooklyn Heights, DUMBO, Cobble Hill, Carroll Gardens. If you live in Park Slope you could also walk or take the B63 bus which would stop right in front of the store. There's a good number of tourists who pass through the area, especially during the warm months. Maybe Apple should open two stores by 2015, one at 66 Boerum and one in Williamsburg.